The Xiaomi Mi Sphere keeps getting better! It now has a self-timer that you can use without the app! Here’s how to use it, plus a video demo. A self-timer is a very important feature for 360 photos because it allows you to move away from the camera after taking the shutter so that your fingers or hands don’t appear oversized in the 360 photo. 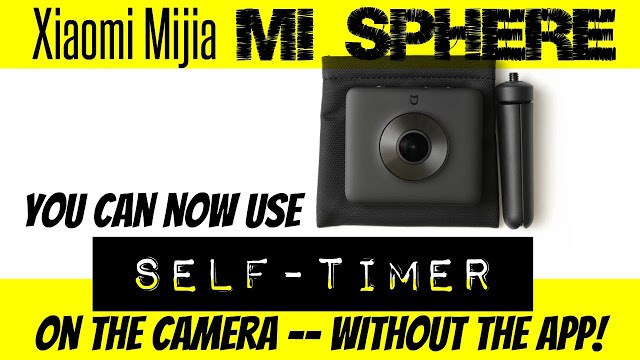 Until now, the Xiaomi Mijia Mi Sphere 3.5K 360 panoramic camera required using the app to use the self-timer feature. But now there’s a self-timer feature that you can use on the camera, without using the app! 1. Turn on the camera and connect it to the app. 2. On the app, set the self-timer to 10 seconds. The camera will remember this setting even if it is turned off, or if the app is disconnected. 3. To use the self-timer, hold down the shutter button until you hear a beep. 4. When you hear the beep, the camera LED icon will start flashing to let you know it’s counting down. After the countdown you’ll here a triple beep, then after about 1 second, it will take the shot and beep to let you know it’s done. As I mentioned in the video, in case you missed it, the iOS app has also been updated to allow shooting up to 32 seconds, and 360 photos now have 360 metadata to make them easier to shoot. However, one issue is that when viewing the 360 photos on Google Photos, the photos can’t seem to be displayed. They look fine anywhere else such as Facebook or even in Google’s own Streetview. I’m supposing this bug will be fixed. In any case, having a self-timer makes the Xiaomi Mi Sphere more useful than ever! You review a lot of cameras, MIc. but I think you do have a soft spot for the Xiaomi Mi Sphere, isn’t it? Keep on the good work, and keep on pestering Xiaomi/GearBest to get more out of this little great camera! love you video on mi sphere. having problem of sharing the photos and videos. I can only view the 360 from the mi sphere camera app. but the minute I send it to my phone memory i dont get a 360 photo. and how do i share the photos and video on facebook and whatsapp in 360 view? appreciate it if you could help me on this. Hi Patrick! Thanks and congratulations on getting the Mi Sphere. When you view a photo on your phone and click on download, the photo is automatically copied and stitched. It will be in the DCIM\MadV360 folder. From there, you can post it to Facebook, and it will be recognized as 360. Re whatsapp, i will post a tutorial by Pepe Vazquez (360 Tips & Tricks). Hi TJ! Congrats on getting the Mi Sphere! Don’t worry — all you need is a Micro SD card and selfie stick. The selfie stick will let you do a lot more with the composition. The other stuff such as the remote are just extra accessories and are completely optional. 1. Turn the camera on by holding down the power button. 2. Press the power button to switch between photo or video mode (you’ll see the LED light showing the mode). 3. Make sure the camera is vertical for at least 3 seconds, before you press the shutter to start recording. Enjoy your trip! I took a once-in-a-lifetime trip just shortly before I got my first 360 camera and totally regret not having one on my trip. But now with the Mi Sphere, you’ll be able to capture memories that you and your kids can re-live on a VR headset!